The Decision was a microcosm of all that’s wrong with ESPN, creating a spectacle out of nothing and turning news into cash. The prime-time idolization of LeBron James was at best an exhibition in what happens when thoughtless millionaires take control of their “brand,” and at worst, a precursor to the sporting apocalypse—a moment when news and business became interchangeable. 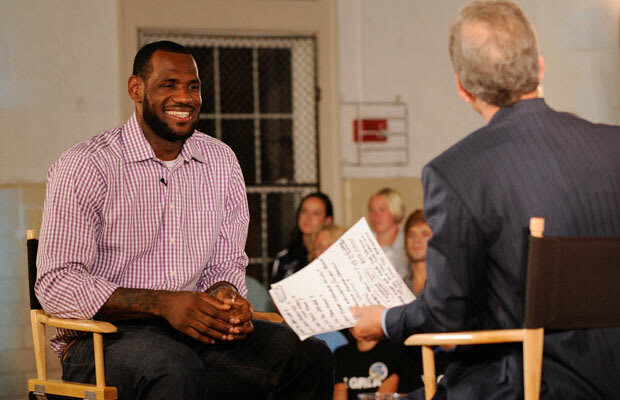 James hand-picked former ESPN reporter Jim Gray as his preferred interviewer and his services, which included sitting in a director's chair and flirting with the King, were bankrolled by James' camp. If choreographing and cashing in on something as lame as a free agent signing weren't insane enough, Gray asked 16 ridiculously stupid questions before getting to the only one that mattered: "LeBron, what's your decision?" It was an instant that that ESPN became a whore and, judging by the ratings, maybe a sad indictment of us all. It didn't matter what LeBron said, "Heat, Bulls, Knicks, or Cavs." The fact that a "news" network relinquished journalistic neutrality to seduce a superstar in front of 10 million viewers is what made the entire event especially disgusting. Sports provide us with a visceral, and some might argue, depressing need to be part of a tribe. We live vicariously through people with superior lives and to displace our own shortcomings on a dropped pass or throwing error. But now, thanks to ESPN, we have an exact measurement of just how far we've fallen.